Last updated April 1, 2019. Posted September 16, 2016 in Books, Case Studies, Featured. This post contains affiliate links. What is the 12 Week Year? Why would I use the 12 Week Year? What are the elements of the 12 Week Year programme? I have never been good at setting and achieving my goals. I would dream of something ambitious, but work and life often get in the way. It was easy for me to let deadlines slide, re-prioritise or just drop the goal altogether. As part of my ongoing self-improvement readings, I discovered the book and now have just completed my first 12 Week Year. I set four fairly ambitious goals and commenced the process on 27th June 2016. I intend for this blog post to document my process and achievements, failures and lessons learned for the benefit of others. The 12 Week Year: Get More Done in 12 Weeks than Others Do in 12 Months is a book written by Brian P. Moran and Michael Lennington, and published in May 2013. In it, Moran and Lennington outline their perception of why many people don’t complete or achieve their goals: they set their horizons too far in the distance. Annual targets are too hard to conceptualise, they believe, leading to procrastination and then failure. The 12 Week Year avoids that by making the timeframes much shorter. By defining each year as 12 weeks long, Moran and Lennington suggest we might have more chance of success in achieving our goals. Implementation of a tracking and internal feedback system is necessary to ensure the best chance of completion. At the end of every twelve weeks, there is a thirteenth week which you can use for completing the last few things to achieve your 12 Week goal(s). This week can also allow review and analysis to decide how to do things better the next time. Finally, you might also wish to celebrate, recharge and refresh before commencing another 12 Week Year. There are four cycles of thirteen weeks in each calendar year. Would you like a spreadsheet to use as a sample plan and weekly scorecard to help you with your next 12 Week Year? Download the 12 Week Year scorecard template for free! Would you like a spreadsheet to use as a sample plan and weekly scorecard to help you with your next 12 Week Year? Go to the full version of this page to download the 12 Week Year scorecard for free! If you’re anything like me, you’ve tried various goal-setting strategies with mixed success. Sometimes you manage to achieve the goal and other times you don’t. Sometimes you’re hard on yourself about that, and other times you move on quickly. The 12 Week Year outlines a set of principles for setting and achieving goals. What it offers might well be a crystallisation of the works of many other authors, as some Amazon critics might contend. If you’re new to the goals and achievement realm it could provide a helpful structure that takes care of some of the common pitfalls that can plague us all. I had no shortage of goals but didn’t really have a handle on how to track and measure their completion. The 12 Week Year creates a structure that enabled me to see how I was tracking to achieving my goals at any point throughout the 12 Week Year cycle. Most of them believed, either consciously or unconsciously, that their success and failure was determined by what they had achieved over the course of a year. They set annual goals, created annual plans, and in many cases broke the goals down into quarterly, monthly, and sometimes even weekly plans. But in the end, they evaluated their success annually. At the heart of annualized thinking is an unspoken belief that there is plenty of time in the year to make things happen. In January, December looks a long way off… We mistakenly believe that there is a lot of time left in the year, and we act accordingly. Moran and Lennington explain their belief that by redefining a year as a twelve week period, success can be achieved. Twelve weeks is long enough to set and achieve goals worth achieving, and short enough that every day and every week must count. The mad rush of productivity that occurs in the countdown to the end of a calendar year will occur four times during the year instead. They contend that the short timeframe means that one can’t simply write off periods of time when one is unproductive. There isn’t enough time in a 12 Week Year to have more than one or two bad weeks if you hope to hit your targets. Finally, with a new ‘year’ commencing every twelve weeks, someone who does have a bad 12 Week Year can regroup and get started again with a fresh slate. It is a character trait, a life stance, a willingness to own actions and results, regardless of the circumstances. Commitment is a personal promise that you make to yourself. Keeping your promises to others builds strong relationships, and keeping promises to yourself builds character, esteem, and success. Greatness is not achieved when a great result is reached, but long before that, when an individual makes the choice to do what is necessary to become great. The results are not the attainment of greatness, but simply confirmation of it. A compelling vision creates a clear picture of the future. It is critical that your business vision aligns with and enables your personal vision. This alignment ensures a powerful emotional connection that promotes a sustained commitment, and continual action. An effective plan clarifies and focuses on the top-priority initiatives and actions needed to achieve the vision. A set of tools and events that align your daily actions with the critical actions in your plan. Measurement drives the process. It is the anchor of reality. Effective measurement combines both lead and lag indicators that provide comprehensive feedback necessary for informed decision making. If you are not in control of your time you are not in control of your results. Using time with clear intention is a must. This applies to people who are executing as part of a team (if you’re on your own, the accountability is all yours). Individual accountability for each goal and tactic is critical! Make sure to include a date by which the goal is to be reached, or the tactic is to be executed. Finally, each tactic should start with a verb, be a complete sentence, and be executable as is. The weekly plan is a derivative of the 12 Week Plan. It supports progress toward the larger goal and acts as a game plan for the week. Form a group of 2-4 motivated people who meet weekly to foster individual accountability. Best held on a Monday morning, lasting 15-30 minutes only. Score points for completing tactics and then divide by the total number due that week to get a percentage completion score. Review the weekly score as part of the Weekly Accountability Meeting. Finally, they also discuss time blocking in order to ensure there is enough time in your calendar to get the things done that matter. (The tasks that move you closer to your 12 Week goals.) I won’t go into this any further for now. Moran and Lennington describe this as a ‘closed system’, in that it contains everything that is needed to achieve success. When applied in this way, the 12 Week Year becomes a self-correcting system that creates a breadcrumb trail that allows you to pinpoint any breakdowns and take corrective action on a timely basis. It is a deliberate practice system that is designed for continuous improvement. Download a pdf version to read whenever you like, for free. You can also have a 12 Week Year excel template to help you plan and score your next 12 Week Year. This post is really long… Go to the full version of this page to download a pdf version to read whenever you like, for free. You can also have a spreadsheet to help you plan and score your next 12 Week Year. When I was planning my first 12 Week Year I had trouble choosing good goals: some things I considered were way too ambitious and others too easy to achieve. Additionally, I knew that I had only eleven weeks for my first twelve week year, as we had a family holiday planned during which I would have no ability to achieve professional goals and limited ability to track and monitor any others. I eventually decided on a weight loss goal, a personal relationships goal and two professional goals. The first professional goal was to confirm that I was closing my private practice after six years, and then do everything necessary to have it finished with no loose ends before our family holiday. In the past, my private practice has intruded on family holidays and it was important that I try to prevent that on this occasion if possible. My second professional goal was to increase my clinical research activities as this has been an area of dissatisfaction when I review my professional performance. As the goal title is somewhat nebulous (“increase research activity” doesn’t really have a clear outcome attached) I decided to focus on setting tactics that would demonstrate progress in and of themselves. So, in 11 weeks, I had four goals to achieve. A weight loss goal that I felt was achievable (5.2 kg in 11 weeks), a personal relationships goal, and two professional goals. The 12 Week Year process suggests tracking completion of tactics (lead indicators) that will lead to goal completion (lag indicators). I just needed a dashboard to bring it all together. Inspired by reading a case study at Asian Efficiency I decided to use a spreadsheet as my execution dashboard. Of course, the rise of internet-enabled devices means I could simply have used a Google Sheets spreadsheet on my phone and the web for tracking, but I wanted something more like a form or checklist. Not wanting to spend more money than necessary, I eventually settled on Airtable for tracking. Airtable allows free users to set up tables and provides a form interface for inputting data. I could use the app on my phone or the web interface to check off that I had completed a tactic for that day, and Airtable would then sum my completions and provide me with an ongoing metric for performance. 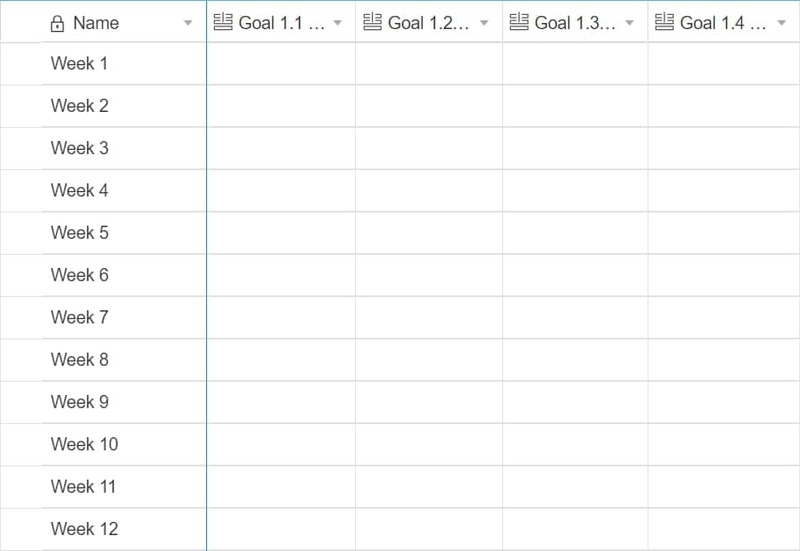 I set up a 12 Week Year tracking system in Airtable that had a table for each of my four goals, and then automatically collated completion and turned that into a percentage for each week. Moran and Lennington contend that a completion rate of greater than 85% each week will usually lead to someone meeting their goal at the end of twelve weeks. My summary table which collated data from each goal’s table. I have been using Todoist daily for almost one year and have found myself to be far more effective as a result. If I accurately capture my commitments in Todoist, I am pretty confident that I will get them done. At the start of the 12 Week Year, I set a new project with four sub-projects. I assigned it a new colour so that it would stand out amongst my usual projects and tasks. Finally, I moved the project to the top of my project lists. I ensured that each tactic I needed to complete had recurring schedules or specific dates. 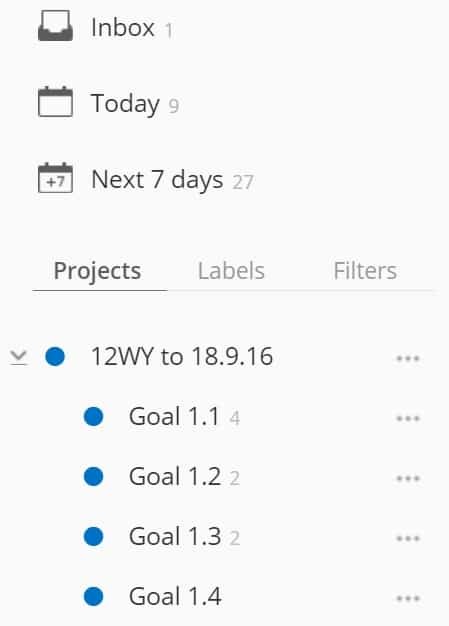 In this way, I was confident I would be reminded of my 12WY goals every time I opened Todoist. This did introduce some duplication to my tracking – I ticked off tasks both in Todoist and Airtable. Given that I use Todoist so frequently during the day, this arrangement made sense in terms of my daily workflow. I checked things off in Airtable at the end of the day, which supplemented a daily review of my progress. Anyone who knows me also knows there have been times in my life where I haven’t been exactly svelte. In recent years this hasn’t been as much of an issue, but I did feel I could afford to trim down a little. My first goal in this first 12 Week Year was to lose at least 5.2kg. I didn’t feel the water diary was core but was trying to solidify a new habit I had started to develop earlier this year, so decided to piggyback it into this goal. I was already using Google Fit on my phone and smartwatch to track activity and had some soft targets that I didn’t track but checked in with from time-to-time. Those were of greater than 2000 calories expended daily and greater than one hour of activity daily. I used an app on my phone and the web to track my caloric intake and another app to track water intake. Google Fit automagically takes care of tracking steps, distance, activity etc. My progress toward this goal varied from week-to-week. It didn’t seem particularly clear that weight loss or stability necessarily followed my weekly completion rate. I had multiple instances in which I was socially obligated to break my diet – workplace functions, social gatherings etc – but always tried to manage that by eating less on other days. I dutifully collected everything I ate in my calorie tracking app, successfully recording my full intake on 61 out of 77 days. Compliance with weekly weigh-ins was easy – I wanted to know how I was going so it was harder to not jump on the scales in the morning than to do so! Finally, I logged water intake of greater than 1.8 litres on 72/77 days. I barely completed any exercise during this eleven week period. I had intended to do some formal exercise like going for a brisk walk or bike ride on at least three days per week. For a variety of reasons (excuses, I suppose) I hardly did any formal exercise at all. I did check in with Google Fit and noted that most days I failed to reach my one hour and 2000 calories targets. I made my goal to lose weight. On day 78 I had lost 5.3kg. In some respects, setting this goal was a bit of a mistake. I won’t be going into exact detail for personal reasons, but this goal was largely around relationships with people important to me. One of the lessons I have learned from my first 12 Week Year is that goals really need to be measurable in order for this system to work. As a scientist and physician, I am interested in data, and tracking lead measures in the way Moran and Lennington recommend holds natural appeal. In other words, I am more likely to achieve my goals if I can set and track specific metrics as I am naturally inclined to look for the data anyway. Although I did identify lead measures, they were a bit ‘fluffy’ and therefore tracking them felt different to tracking the metrics for the other goals I had set. Finally, there were a series of personal life events that occurred during this 12WY cycle that made it very hard to meet the lead measures I had identified, and therefore to achieve the end goal. Although I don’t consider this goal to be a failure, I have learned valuable lessons for the future in terms of setting achievable goals and measuring my progress toward them. I am confident these lessons will hold me in good stead as I prepare for my next 12 Week Year. This was a big one. My practice had become less rewarding over time, especially in light of my newly rediscovered passion for teaching. I am studying a clinical education higher degree, and working full time as well. I didn’t feel I had the time or motivation to continue in this role. Given all of those factors, I wasn’t spending enough energy on promoting the practice or getting the most out of my work there. In sum, I was in a situation I wasn’t enjoying and felt I wasn’t doing myself or my practice justice. After many long discussions at home, I finally decided to close the rooms. The first tactics I needed to complete were to speak with the team who run the practice and let them know my decision. This was delayed by a week or so due to (their) overseas travel. After telling people that I would be closing, I then sat down and went through to find patients I needed to see before I closed, those with prescriptions that were important and needed to be followed up, and patients having imaging follow-up etc. Finally, there was a long list of reports to write before leaving. Once I set the closure date, it became a little easier to focus on achieving this goal as it was so clear what had to be done and by when. This reminded me of what Moran and Lennington seem to be trying to ensure by suggesting 12 Week Years instead of the annual year we are used to. By having a clear, medium-term, stop date, I had to do what I had to do to be done. There was just no wiggle room to allow for procrastination. Despite that, I certainly wiggled where I could. Some weeks were better than others, but in some weeks I found it hard to motivate myself to complete work for a job that I had decided I didn’t want to maintain. This confirmed for me that I had made the right decision, but did limit my progress to my goal to a degree. In the final assessment, however, I closed my practice in week 10 of 11 and the patients have appropriate ongoing management arranged. I made my goal. I closed my practice on day 64 (Week 10). As stated above, the title of this goal is nebulous and doesn’t really give much insight into what the target is. I had a list of things that might be good to achieve that fall under this domain, and that I knew would contribute to a greater sense of achievement. A grab-bag of activities might not excite the goal-achieving senses, but I hoped there was enough to keep me interested. After identifying that I had a few ideas for small projects, I set a schedule of meetings, sent emails and made calls. I had also agreed to supervise a student research project in early 2017, and this would require completion of a literature review before applying for Ethics Committee approval of the project. Finally, I also felt I wanted to experience more of the peer review process for journal publication, so I contacted several editors and offered my services. To my great surprise and delight, one of those journals saw a larger role for me than I had imagined. I have completed my first task in this role and am excited by the potential in the future – I think I will learn a lot. I achieved my goal. I submitted two projects for Ethical Approval with my collaborators and joined a journal’s editorial team. Now I am in a good place to increase my research output in coming months and to learn much more about peer review, which were the original overriding goals. Download a pdf version of this post and a spreadsheet to use as a 12 Week Year planner template and scorecard. Go to the full version of this page to download a pdf version of this post and a spreadsheet to use for planning and as a weekly scorecard. My schedule is quite variable when compared with that of a full-time employee within a company. I have one workplace on Monday, another on Tuesday and Wednesday and yet another for Thursday and Friday. This meant I made little use of the scheduling and time-blocking advice given by the authors as much of it was of little relevance to me. I also needed to adjust my expectations during a period in which I was on ‘ward service’. When I do inpatient work with our junior medical staff I am scheduled to be on for four weeks, with overnight calls and ward rounds during the day. I need to adjust my usual schedule during these periods and needed to factor this into my expectations for how much I could move forward on my 12 Week goals in that time. One of the major barriers was other people. My work – as for most physicians – has a lot of time that I spend on other people’s priorities. I can’t necessarily schedule things and know that they’ll happen as intended. I need to plan, but also allow for flexibility, and learn to adapt as life evolves. One of the major issues I faced was the lack of an accountability partner or team. I like the idea of a Weekly Accountability Meeting (WAM) but had to make my own version with only me participating. I suspect I missed out on many of the benefits of the WAM, including encouragement and advice from others who had experienced similar roadblocks. Also, I found that my adherence to the WAM was quite poor. Monday mornings have been part of my most busy day until I closed my private practice, so making the time was a challenge. I did find the process rewarding, in that it helped me to re-focus on the goals I had set and remind me of the plan for the week ahead. Finally, the WAM could be included as part of a regular weekly review, a productivity best-practice that you should probably be doing anyway! I found the short period of 12 weeks helped me to focus at times when my motivation was lower. Knowing that time was moving on and I needed to keep moving forward was empowering. It provided a big ‘stick’ acting in complement to the ‘carrot’ of the goals I had set. I also found that knowing there would be a reward (family holiday) at the end was helpful in maintaining focus when I was getting up at 5am to write essays for my course or staying back late to complete reports. Of course, I still had the usual obligations and commitments to manage, so I needed to work very hard during this period to meet my goals. I came to the end of my 12 Week Year feeling exhausted but satisfied. The completion of three of my four goals feels great, and I have enough momentum to start thinking about my next 12 Week Year. There are many elements of what the authors describe that are directly relevant to my situation. There are others that I needed to modify or discard altogether. I am sure that many professionals would have to make similar choices. Rules that apply to people who work for a company and have a manager they report to are different to those that would help the self-employed. Another factor is that a lot of our time can’t be blocked out or scheduled as we might like. I have fixed clinics during the week that take 3-4 hours at a time, and therefore I needed to allow for those when planning my task completion, as well as for the ‘administrivia’ that comes with being a physician. I have learnt from my experience of setting Goal 1.2 and aim to make all of my goals focused and measurable. I can’t understate the satisfaction that came with checking things off. Knowing that I was moving forward on my goals provided a powerful sense of encouragement. I plan to reduce to three goals for my next 12 Week Year. Four goals made things slightly harder to focus appropriately. I will have one personal goal, one professional and one other, the nature of which I am still considering. It would be much better if I was able to consistently check things off rather than having bursts in some weeks and not others. Sometimes the gaps – especially in Goals 1.3 and 1.4 – related to factors outside of my control. There were weeks, however, when I just dropped the ball. For my next 12 Week Year, I aim to be much more consistent. As seen in my tables, I might not have set goals with clear-cut lead indicators that can be followed to ensure execution. I look forward to planning my next 12 Week Year to see whether I can come up with more readily measured lead indicators. Finally, I want to find an accountability partner. I have been playing with the idea of joining a mastermind group for some time, but don’t really know how to find one. I would like to think that if I can find someone with similar goals we could help each other move forward. So, that is my enormous combined 12 Week Year book outline, case study and implementation guide. If this article was helpful, please consider signing up for our mailing list.